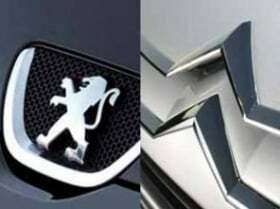 PARIS -- PSA has set a 550,000 annual production target for the new Peugeot 208 subcompact model seen as crucial to restoring the struggling automaker's fortunes, its industrial director, Denis Martin, said on Friday. "The production target is of 550,000 vehicles worldwide on an annual basis, that is to say from 2013, of which 400,000 would be in Europe," Martin said on the sidelines of a launch event for the new car. Martin, speaking at the company's plant in Poissy on the outskirts of Paris, said it would handle 40 percent of European output with another French factory near the German border taking another 20 percent and the company's Slovakian plant churning out 40 percent. PSA, Europe's no. 2 automaker, is counting on the 208 to help it close a growing gap with European market leader Volkswagen after a year which saw the French company repeatedly slash targets. Its auto division is expected next month to post a significant full-year loss for 2011. The 208 is the successor to Peugeot's 207 model, which was the best-selling European car in 2007, according to data from JATO Dynamics. In 2011, PSA Group sales in the EU and EFTA countries fell 8.8 percent to 1.68 million cars, according to figures from the Brussels-based industry organization ACEA.